Donald Jedlicka, 89, of Schuyler, died Monday, February 12, 2018, at the Schuyler Care and Rehabilitation Center in Schuyler. 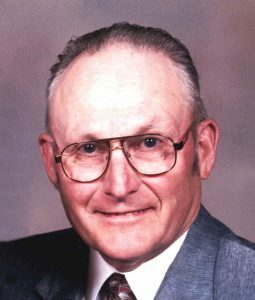 Funeral Service Friday, February 16, 2018 10:30 a.m.
Visitation Thursday 4-7 p.m. - Knights of Columbus Rosary 7:00 p.m.
Donald Frank Jedlicka was born on March 1, 1928 to Frank J. and Agnes (Maliha) Jedlicka. He graduated from Schuyler High School in 1946. He attended Midland College, Fremont and served in the US Army before returning to the family farm. He married Stephanie Kasik in 1951. To this union four daughters were born; Nancy, Linda, Gail and Amy. Donald married Corabelle (Corky) Emmons on Dec. 28, 1976. Survivors include his daughters: Linda Rhoades and Nancy Jedlicka, Lincoln, Amy Heavican, Omaha, grandsons; Colin, Joey and Nathan Heavican, Omaha, stepson Ron Emmons, Osceola and special friends Lloyd and Betty Brichacek, Lumir and Connie Jedlicka, Margie Waller and Darlene Mastera along with many relative and friends. He was preceded in death by his parents, wife Corabelle in October 2017, daughter Gail and stepson Dennis Emmons.